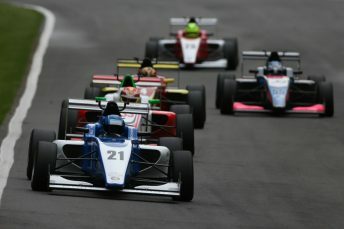 Experienced single-seater squad Hillspeed with Cliff Dempsey Racing secured its best combined team result of the BRDC British Formula 3 season at Brands Hatch on Sunday, 6th August, with first year F3 drivers Chase Owen and Nick Worm both finishing inside the top 10 in round 17. Competing on the unique Grand Prix configuration during the sixth event of the campaign, the Hathersage squad took away a best result of sixth place with American racer Owen in the second race of the weekend while car racing rookie Nick Worm secured ninth – his highest result to date. Both competitors chalked-up points results in all three races at the Kent venue with Owen consolidating seventh position in the standings while German racer Worm climbed two positions into 14th spot in the championship. During pre-event testing on Thursday, 3rd August, and Friday, 4th August, which took place on the shorter Indy Circuit, Owen was absolutely inspired and topped the timesheets in all four sessions on the opening day. Lapping second fastest during the first run on day two, he then moved to the top of the times in session two and was second quickest again in both afternoon sessions. Aiming to carry that form through to qualifying on the full Grand Prix track on Saturday, 5th August, Owen instead had to settle for ninth on the grid for race one while team-mate Worm was 16th fastest on his first ever outing on the challenging 2.4-mile layout. Owen slipped back a couple of places to 11th position on lap one and remained there during the first half of the race, while Worm moved up into the top 15 and also maintained position to the midway point when rain started to fall. Getting heavier, and making conditions treacherous, two rivals came to grief on the slippery circuit at Paddock Hill Bend on lap eight which enabled Owen and Worm to move up into ninth and 13th respectively. Triggering the deployment of the Safety Car, officials soon chose to red flag the race with conditions worsening. Finishing ninth, Owen just missed out on the top eight ‘reverse grid’ pole position for race two while Worm lined-up for round 17 on Sunday morning at the head of row seven. Getting away well at the start, Owen’s hopes of making early progress were hit at the exit of Druids on lap one when he was forced off the track in avoidance of a multi-car incident. Recovering in 12th position following the early dramas, the American ran behind his team-mate, who gained two positions on the first lap from his grid slot, and the Hillspeed with Cliff Dempsey Racing drivers circulated in close company before Owen managed to get ahead on lap four. Pulling away and hunting down the tightly bunched pack ahead, Owen started to close down his rivals before racing then fell under Safety Car conditions on lap nine due to cars off the track at both Druids and Stirlings. Racing action resumed on lap 11 with Owen in an elevated eighth position and Worm holding 11th still, having been edged back by a couple of rivals just prior to the cautionary period. With no further changes during the last four laps, Owen pressured hard for more but had to settle for eighth, just 0.6 seconds behind Jamie Chadwick, with Worm holding off a recovering Cameron Das for 11th spot. Post-race, however, officials excluded two cars from the results – one competitor for driving in a manner incompatible with safety and the other due to car eligibility issues. Owen, therefore, was elevated into sixth position with Worm vaulting into ninth. Starting round 18 from eighth on the grid, Owen maintained position to lap nine when slipping behind Toby Sowery and stayed there to the flag on lap 14 in an uneventful encounter. Worm in the sister car did initially gain a place from 16th into the top 15 on lap one but after being nudged back behind Omar Ismail on lap two he remained there for the duration. “Everyone was pleased to get both cars in the top 10 in race two, but it’s been a weekend where we feel we should have taken away more”, said team principal Richard Ollerenshaw, “Testing for Chase on the Indy Circuit was exceptional, two fantastic days, but unfortunately that didn’t follow through to qualifying and the races on the GP track. He did reinforce seventh in the championship though. Snetterton 300 Circuit in Norfolk will host the BRDC British F3 Championship for the second time this season three weeks from now, over the weekend 26th/27th August.